Sister Joan Marie Sanchez, CST, died December 4, 2009 at Heritage Park, Bethany. Born February 19, 1931, in San Luis, Colorado, daughter of Albert and Bertina Martinez Sanchez. Educated by the Sisters of Charity, she received her B.A. in Sociology/Spanish from St. Mary College, Leavenworth, KS in 1953. Sr. Joan Marie entered the Carmelite Sisters of St. Therese that summer, making vows March 19, 1955. Her lifetime of classroom teaching included elementary grades in Villa Teresa School, OKC, and St. Francis, Newkirk, OK. She earned an MA in Spanish from Notre Dame University. She became known as "Hermana" and "Assumpta" while teaching Spanish at Catholic High (Bishop McGuinness) for 24 years, then short stints at Mt. St. Mary's High School and Sacred Heart, OKC. She missioned a year in Guatemala in 1961 and Frederick, OK 1978. She later continued parish/social ministry at Sacred Heart and St. Joseph's, OKC. Taught public school evening classes of ESL, spent many summers as Water Safety Instructor for Villa Teresa School. 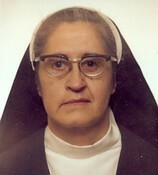 Sr. Joan Marie worked tirelessly with Birth Choice. She especially enjoyed teaching federal prisoners in Leavenworth, KS, in the early 1990's. She is preceded in death by her parents, infant sister Cordelia and brothers Arthur (WWII), Joseph and Edwin. Survived by brother Albert of OKC, sisters Cordelia Ramirez and Mary Frances Duran of Colorado, nieces Sister Stephanie Sanchez, CST, and Beverly Sanchez of OKC and nephew Arthur of Denver, and many dear nieces and nephews worldwide. 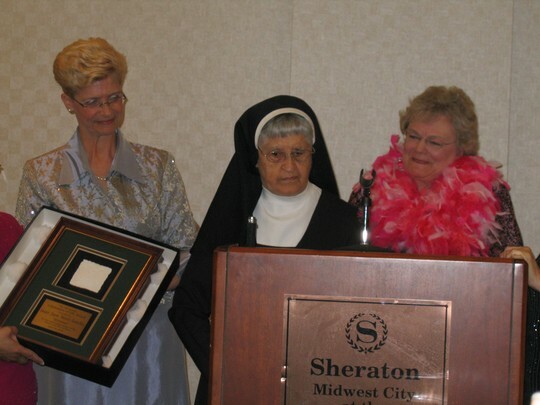 Left to right: Jan O'Neill, Sister Joan Marie Sanchez, and Katie (nee Tener) Gordy. The award was the Celebration of Life Award given to Hermana in 2006, by Birth Choice.